Observation bias is low in the case of mechanical observation because a human observer is not involved. It is also low for audits. Although the auditors are humans, the observation usually takes place on objects and the characteristics to be observed are well defined, leading to low observation bias. Observation bias is medium for trace analysis and content analysis. In both these methods, human observers are involved, and the characteristics to be observed are not that well defined. However, the observers typically do not interact with human respondents during the observation process, thus lessening the degree of bias. It is high for personal observation due to the use of human observers who interact with the phenomenon being observed. No questionnaire administration method is superior in all situations. 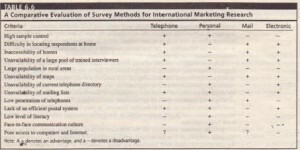 Table 6.6 presents a comparative evaluation of the major modes of collecting quantitative data in the context of international marketing research. In this table. the survey methods are discussed only under the broad headings of telephone. personal. mail. and electronic (e-rnail, Internet) interviews. The use of CATI. CAPI. and mail panels depends heavily on the state of technological development in the country. Likewise. 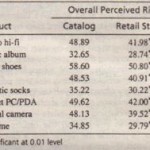 the use of mall-intercept interviewing is contingent upon the dominance of shopping malls in the retailing environment. The same is true for e-mail .” and Internet surveys. which rely on access to computers and the Internet. The major methods of interviewing should be carefully evaluated on the criteria given in Table 6.6. as shown. Another very important consideration in selecting the methods of administering questionnaires is to ensure equivalence and comparability across countries. Different methods may have different reliability in different countries. In collecting data from different countries. it is desirable to use survey methods with equivalent levels of reliability. rather than the same method. as illustrated in the following example. With worldwide sales accounting for about SO percent of its total, Reebok is marketed in more than 170 countries as of 2009. Currently. Reebok is seeking to expand in Europe and would like to institute strong marketing programs to sell street sneakers to the European masses. A survey of consumer preferences for sneakers is to be undertaken in three countries: Sweden, France, and Switzerland. Comparability of results can best be achieved by using the dominant mode of interviewing in each country: telephone interviews in Sweden. central location/street interviews in France, and in-home personal interviews in Switzerland. I. If a survey is to be conducted to detennine small businesses’ preferences for software products, which survey method would you recommend and why? 2. Discuss the role of the type of research you recommend in enabling Steve Ballmer to determine small businesses’ preferences for software products. I. Steve Ballmer is wondering what Microsoft should do to effectively meet the needs of small businesses.What is your recommendation? 2. Discuss how the marketing management decision action that you recommend to Steve Ballmer is influenced by the type of survey that-you suggested earlier and by the findings of that survey.